Despite the extra hot temperature, a light denim jacket, like this one from Forever 21, is one of my favorite ways to style summer ensembles. This simple addition can take a basic skater dress from just another bland number to a fabulously styled look in seconds. They're no longer just an 80's memory. They're back with a fash vengeance and every celebrity under the Hollywood sun, from Nicole Richie to Cameron Diaz, is rocking this summer essential. Available at all price points, there's simply no reason any closet should be sans denim jackets this season. Below are some of my favorite celebrities rocking this denim must-have all over LA! Which look is your fave? I recently received these amazing over sized triangle earrings from Frock Candy and instantly became obsessed. The best part... they're only $12! Hello deal! Be sure to pick them up here! You're always so stylish and glamorous even in casual outfits! lookin great as usual! I love all your bracelets! Love your dress & Anna & fab styling ideas. I have a trusted denim jacket I swear by!! I'm loving denim jackets at the moment and the third outfit you've created with the floral dress is just my ideal for Summer! Fabulous looks! Can you tell me where I can get the mint heels in the first "how you can wear it" picture, please?! I just simply love your style! You did amazing job. I have been lusting after a denim jacket forever, I think I shall finally get one. Great post, love the denim jackets! your denim jacket is great! what an amazing style! Cute pictures! I love the light color of your denim jacket. I've a similar one, only slightly darker and I wouldn't want to miss it! Especially in summer, I have it with me ever day. The mint earrings are too cute... 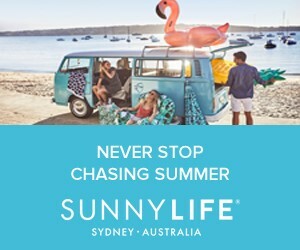 I wonder if they post to Australia? Great post! I couldn't agree more about denim jackets! I love mine and am looking at getting the denim JCrew vest as well. Too much?!? Cute outfit! And like the celebrity-photos! So true! I wear mine all year round, but have a great cropped one with 3/4 sleeves from Topshop, which is my summer go to jacket. SO GORGEOUS! Love your outfit! That dress is out of control! It looks so gorgeous on you! Very cute combo with the denim jacket! 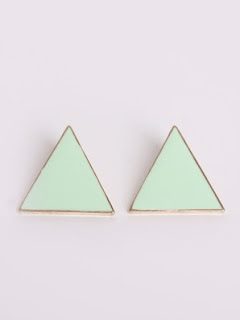 Love the triangle earrings, so cute, especially the mint ones!! Anna, you look amazing. The earrings are gorg. I also have a denim Jacket for the summer evenings. Love how they look like with dresses. I love this look!!! my favourite is how you have matched your shoes with your dress! fab! Love a good denim jacket! Some really great styling picks, those earrings are amazing too! ps: I'm following you, you have very interesting posts here!! Holy cow those earrings are stunning. You look beautiful, Anna. Beautiful style. I love jeans jacket and your combination is amazing. Pretty colors and beautiful dress. Beautiful post dear!!! ...great outfit ( love the jacket )...but I completely fell in love with your dress!!! 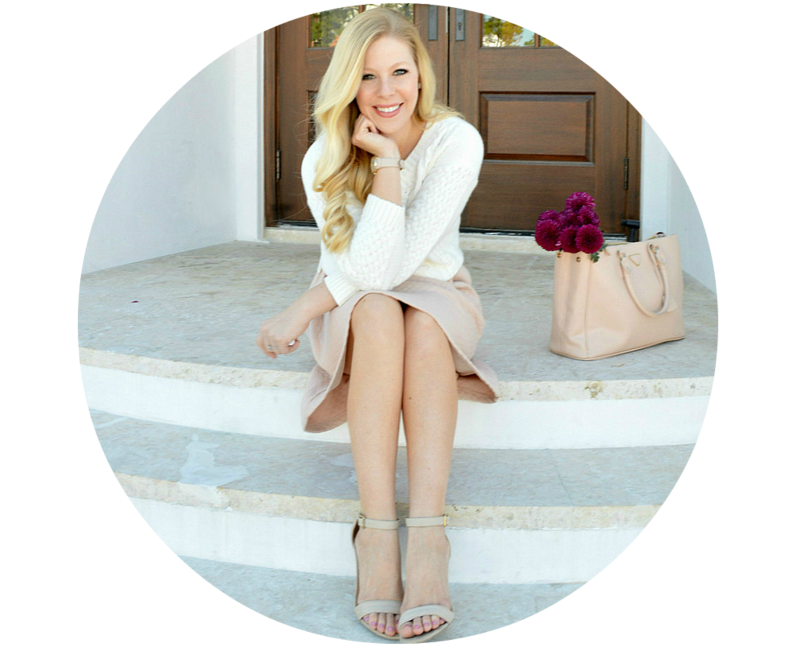 wow I absolutely love your look and blog! amazing! Well my first favorite is yours, obviously. Then Reese. Great post, Anna. I always love your trend reports. Great post dear! Your denim jacket paired with a dress looks fabulous! hey, thank you for your nice comment on my blog! It is sad to say that I don't own a denim jacket! I really need one for back-to-school. Oh and i love how demi lovato wore her denim jacket. I love me a denim jacket, especially over something dainty like a floral or lace dress, it gives it a little edge. i wear my denim jacket with EVERYTHING! seriously. EVERYTHING! i even wore it in some of my WEDDING pictures. yeah. love it! WOWW I love your outfit and the way you completed your post with other look ideas! You blog is really amazing, the header is gorgeous! Visit my blog and follow it if you like! Kisses from Portugal! LOVE the denim jacket with that dress - so cute! Aww you look sooo amazing! I love it! Love all of the denim jacket looks and of course you look super cute. Love those fun earrings too! You look flawless. Love your jacket. You always nail it with the accessories. 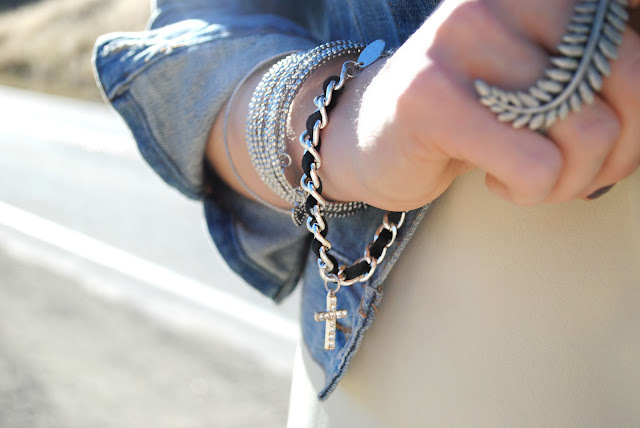 Adore the mint earrings and cross bracelet. How can I get these sunglasses? I love a denim jacket, especially in the summer with a sun dress on a casual friday at the office. Perfect! LOVE everything about this outfit, girl. Demi's look is my favorite for the celebrities. Great colors. Denim is a Must-Have staple is any fashionistas wardrobe! Great post! So, I want all the polyvor outfits you made. lol. You've sold me on the jean jacket. My mind always pairs it with jeans, which turns me off. I love how you styled it with a dress. I recently picked up a great denim jacket and can't wait to wear it! I love your outfit! I really need to buy a denim jacket but I always think it makes me look like I'm trying too hard? Love jean jackets and vests! I have had the same J.Crew jean jacket for years now and it is such a staple in my closet! Wow, I must be a "fash psychic" because I've been rocking this sort of look for a couple of summers now. 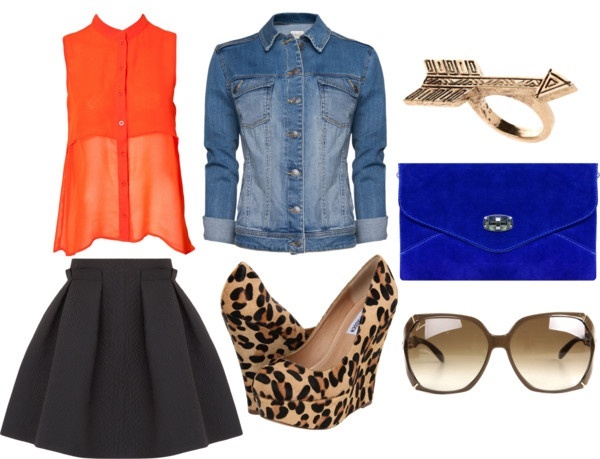 I really like how a denim jacket sort of toughens up a sweet skirt and top combination. Plus it helps with those chilly East Coast summer evening/too much AC issues. I love all of these looks...I really need to go ahead and purchase a denim jacket before fall! You look gorgeous, I love that dress. Totally agree about denim jackets. I love mine and plan to wear it all the time when the weather starts to cool. You are just too cute! Thank you so much for your sweet comment on my post :)I absolutely adore this outfit and would totally wear the whole thing! What always scares me from wearing a denim jacket is that I have no clue how to style it. You've done it perfectly! Thanks for all the styling tips Anna! Going to give it a try tomorrow! Totally agree with you, love the denim jacket trend!! LOVE the denim jacket look and those earrings. Great post, Anna! Love all of the look you styled, especially the one for "date night." The triangle earrings are adorable, too! Thank you for visiting my site! I love your post! I literally live in my denim jacket. It was one of the best buys because I wear it with so many things! I love mixing denim jackets with a girly sundress or maxi skirt! Great post! I totally agree. There really isn't much that doesn't pair well with a denim jacket. I am really loving your blog. I'm your newest follower. Thanks for checking mine out! Love LOOOOOVE this dress! And you couldn't have styled it better! I mean, the jean jacket is a perfect staple for a dress like this! Way to go! thanks for the sweet comments on my blog doll! and your outfit with the denim jacket is gorg! I've been on the prowl for inspiration on how to revamp a denim jacket. I actually did a post on it a while back. This is a very helpful post. I especially like it paired with bright colours and maxis. Ahh, gotta love Reese Witherspoon! Her fashion sense always amazes me - she's so chic and classy. I admire her so much! You look gorgeous! Love the denim jacket inspiration too! You look great here!! Love the hi-low hemline on your dress. You look SO beautiful, I always love your style but I totally adore this look - it's so summery, airy and gorgeous <3 You're a real stunner! So many things can be done to a denim jacket to give it a completely different look. They are very versatile. I love the way you wore the denim jacket with the hi-low dress. I also love all the options and examples you provided! I have held onto my one denim jacket for soooo long. Thank-you for reminding me I can use it again! I think I will pull it out when I go downtown one of these evenings. Doll u look gorgeous ! And ur outfit looks stunning, for some reason I'm not a huge fan of the Jean jacket , but u made me reconsider it, cuz u paired it so well, loving it! I agree. Jean jackets are so versatile and can pull an outfit together. I love yours and the dress you're wearing as well! This is such a cute look :) Denim jackets are a MUST in my opinion. However, if it gets too hot I prefer a denim vest. i love my denim jacket... while is super hott in the south now and i would die if i wore it... it is a fall staple for me! I love that denim jecket and how you have styled it!!! Love your outfit. I've definitely been wanting to incorporate a denim jacket into my wardrobe for a while, but I can't decide if I should buy one at Anthro with my employee discount or keep holding out for a good thrift find to pop up. You look great! I rely heavily on my denim jacket whenever the weather permits! 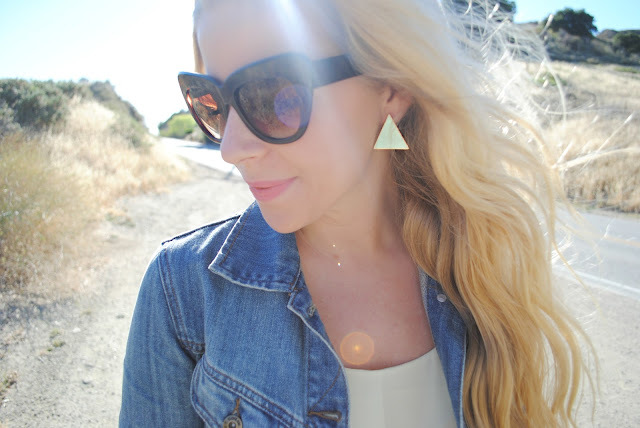 I love those triangular earrings - I'm definitely going to have to check them out! Thanks so much for commenting on my blog post! **Keep up the awesome posts at LC.com! Love em. I love your date night and floral dress outfit! So cute! Really love the trend, but haven't found a great jacket yet. Thanks for the suggestions! Also those triangle earrings are perfect. So versatile, and a nice pop for summer! I love your blog and I think you´re beautiful and stylish. Loving the denim jacket trend. You look great! OMG, gorgeus Anna! I love this post. I just want to wear mine right now, haha!! Love you!! I really like the dress under the denim jacket. Those triangle earrings are the best. i totally need a denim jacket and denim vest now!! I love the denim jacket trend...esp with the street chic layers, like a pair of black skinnies and a gray cotton tunic and boots. It's just so fun! I love that floral dress! Its beautiful. I've always been a fan of the denim jacket, so glad its coming back. love me a denim jacket, and a vest too ... you look wonderful! LOVE anything denim- jeans, vests, jacket! This look is too cute! Thanks for your lovely comment on my blog. I’m a new follower too! Very cute! I love denim jackets! I have that orange dress with the flowers on and I love it, I never thought about pairing it with a denim jacket, that's such a good idea. I'm new to blogging and would love it if we could follow each other. I'm already following you. So many cute outfit ideas! Your leaf ring is especially fantastic! Very cool blog! Wow... I love your outfit ideas! Stunning! Perfect location for your denim jacket look. Love your airy dress and sunnies! Very cute! I know this post is about jean jackets (which I love!) but I am totally loving your dress! So cute and summery! I love deim jackets! They are a must! You look awesome as always ana!! Love your post! You can't go wrong with denim jackets and dresses! Fabulous outfit as always! I really love the triangle earrings! love the earrings! and those wedges are perfect! You look amazing. great post, anna. yeah girl!!! love this post. so glad the denim jacket is making a comeback! I haven't owned a denim jacket in years but you're making me want one! I love your arm party.... sweet look! So cute! Love those heels! seriously obsessed with your blog. New fave. hi anna! thanks for visiting my blog. i love yours. i agree, the denim jacket is definitely making a come back. i used to have a dark denim one ages ago, but i have to admit that i really like the faded out light washed denim jacket. in fact, i had a little boys gap one that i found to fit me and then i cut it into a vest. fun. i'll be visiting your blog again, soon. you look stunning, Anna. Great earrings. i really like your outfit and looks great with the demin jacket.. Thank you for your comment, lovely! I'm not entirely sure what it was you wanted me to look at, but I've just lost myself in your blog. Your style is flawless! You wear it so well! I follow you! I cannot agree with you more on this subject. I have had my vintage GAP jacket forever and the reason its vintage is because I HAVE owned it that long!!! haha talk about dating yourself! But I love love love everything about it and when I left it in one of my college classes I plastered the campus with REWARD posters to get it back, which I did, THANK goodness. LOVE the combination with the turquoise Zara sandals! Stopped by your Lauren Conrad post as you requested and I think you're doing a great job! Will keep checking on you! Best post ever. YOu are one stylish gal. Love this :) You're fab! Awesome post, reminding each one of us that there's a denim jacket in our closet waiting to be re-born!!! Congats! Credits for Jessica Alba's style! This is a great post! I'm old enough to have worn a denim jacket in the 80s (in elementary school), but I still love this look and need to get one. I'm following you on Bloglovin'! Gorgeous dress... love it ! LOve denim jackets but somehow I never wear them because they are so tight over my shoulders! Love them on you! Great dress too! Thank you for your kind post on my blog! I am obssesed with denim Jackets! I struggle not to wear one everyday! I have 4. Just wanted you to know you have done a wonderful job with your blog and it seems you life so far! You are very inspirational to me. Keep it up! Love this !!!! you look so cute as always. Wow! i love deni..and i love your jacket too!!!! I just had to share about those earrings on my blog today, for my 'Current Crush' of Simple Geometrics. Denim jackets are so classic & timeless....thanks for these inspiration!!!! Looking great, these pictures are extra beautiful as well! The outfits you've put together are amazing! I like Miranda Kerr's styling of the denim jacket too. You look fab! It's just proof that you should never get rid any clothing. I had the cutest denim jacket years ago...hummmm where did that go? Once it gets a little cooler I'll be sporting one. Fun post. Love your outfit! Gorgeous jacket!! The denim perfectly coordinates with the hem of your skirt. Love it. Great fashion picks BTW. I love my denim jacket! It's so comfy and easy to throw on over anything. You look so beautiful! Thanks for your comment in my blog! I love your pictures and of course I believe denim jackets are a need in our closset. A denim jacket is really an ace! It's cool and goes well with everything! I really liked the style. I follow after that. I've been looking for a great denim jacket! I love yours and the way you styled it with this breezy dress and stack of bracelets.